Xherdan Shaqiri admits he is loving life at Liverpool as he continues to push for a regular starting spot with the Reds. The Swiss international has asserted himself as a viable candidate to fill the Reds’ playmaker void with a bright impression since signing from Stoke City. He has already registered three assists across all competitions this season and scored his first competitive goal for the club in the recent 4-1 win over Cardiff. Having endured a slow introduction on Merseyside, Shaqiri has since put himself in strong contention to play a valuable role in a midfield seriously lacking creativity. The 27-year-old could be in line for another start when Liverpool aim to extend their unbeaten Premier League record at home to Fulham on Sunday. His absence was evidently felt during Tuesday’s 2-0 defeat to Red Star Belgrade, with Shaqiri having been left at home by Liverpool as a means of swerving political distractions. A striking influence as a floating presence between the opposition midfield and defensive lines has seen the £13million man tipped to enjoy an expanded role under Klopp over a busy festive period. 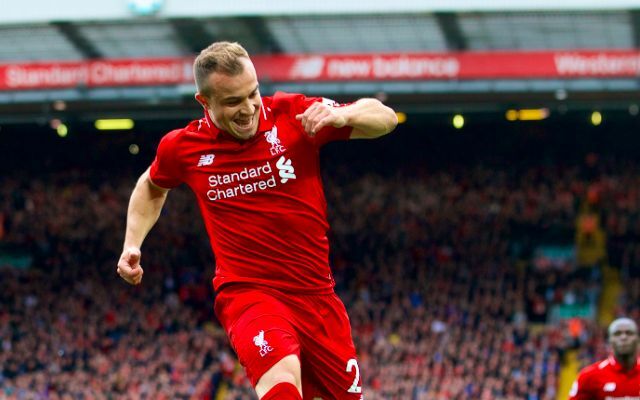 For the Reds boss to find a regular place for Shaqiri in his team would be a monumental boost in the bid to both quicken the transition from defence to attack and grant Roberto Firmino and Mohamed Salah the freedom to remain higher up the pitch.